Have you ever cheered for a fish? 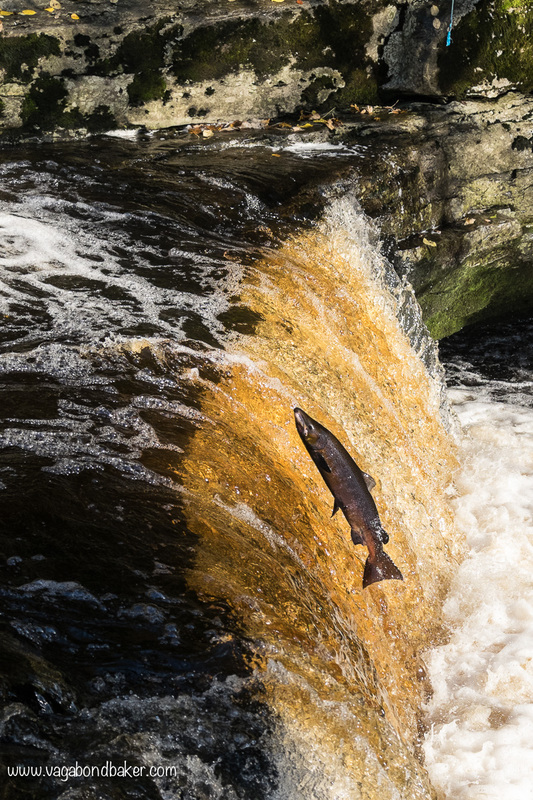 Every autumn Atlantic Salmon make the epic journey up river to spawn, returning to the place they were born. This would probably go unnoticed by most people if it wasn’t for the waterfalls and weirs that stand in their way. 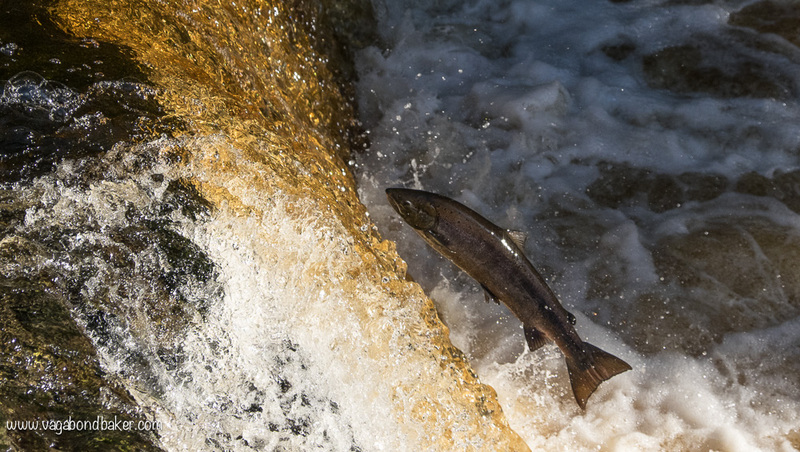 To continue up river the salmon take flight, leaping up from the boiling froth under the waterfalls into the raging flow. It is a wildlife spectacle that leaves you both mesmerised and rooting for the fish! Every mis-timed leap that results in the fish landing on the side or not quite making the top generates an ‘ooo’ of compassion from the watching crowd. 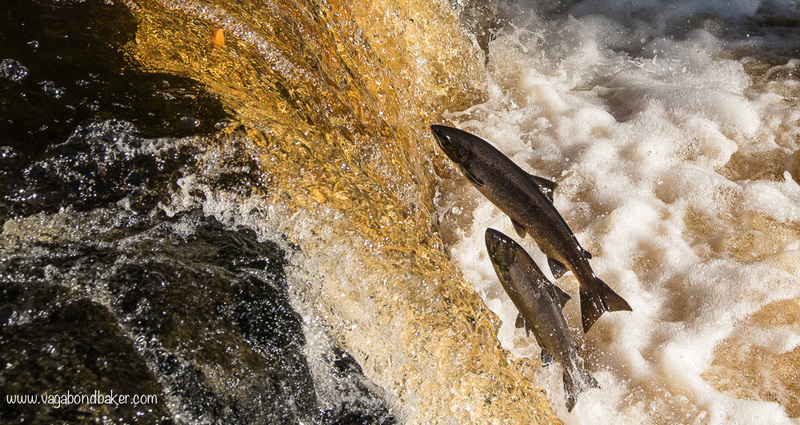 This journey will be the last many of these salmon make, they will lay their eggs and die. You can’t help but cheer them on, it is an astounding feat. It is also a good opportunity to photograph and view a living creature that usually can only be seen underwater. Their scales glitter in the November sunshine, a wash of colour if they catch the light right. Quite beautiful, yet with grim determination on their faces. 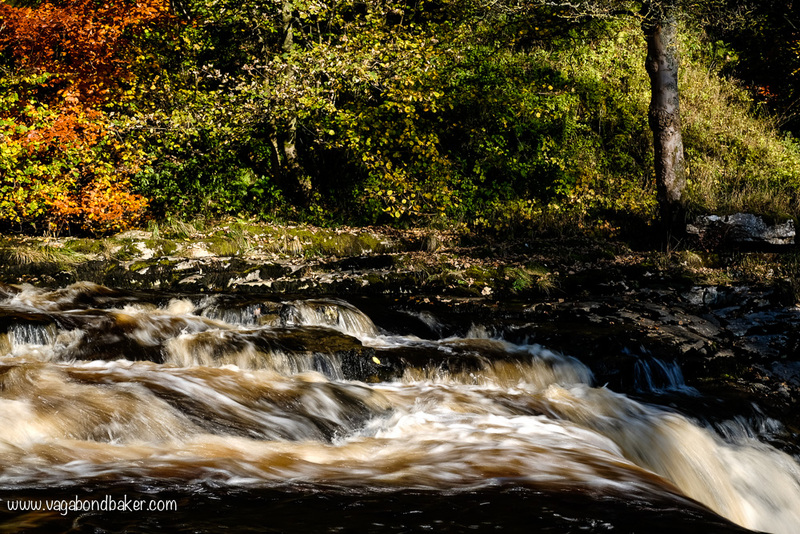 These photos were taken this week, at Stainforth Foss waterfalls near Settle in the Yorkshire Dales. It is a popular spot for wildlife photographers and walkers alike as the location is incredibly pretty. 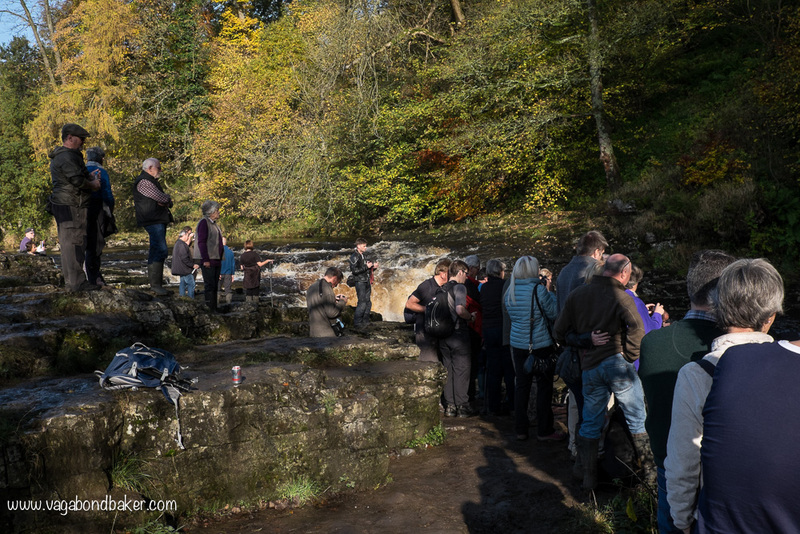 The River Ribble tumbles over a series of three low waterfalls into deep tea-coloured pools, beautiful at any time of year but particularly lovely with the hues of autumn trees and the excitement of the salmon run. We had to wait a few weeks to see the salmon as the extended period of glorious dry weather had left the river too low for the fish, leaving them gathered downstream. 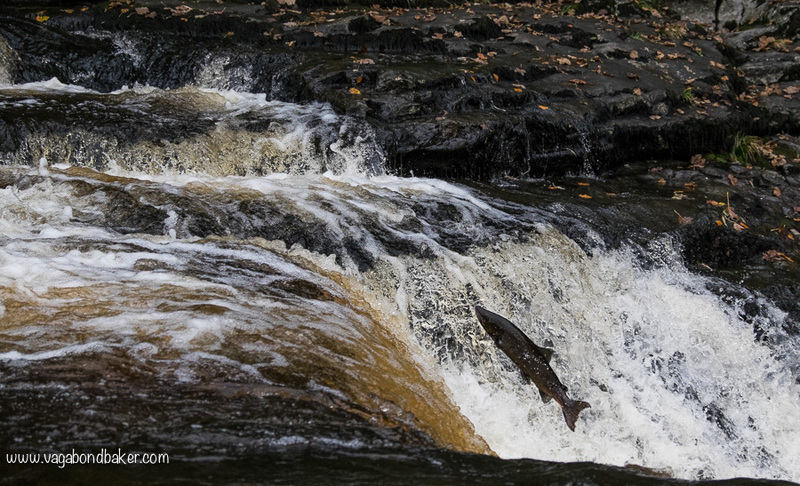 A heavy deluge of rain had flooded the river again and the salmon had set off, making the most of the raging torrent. The more I watched the fish over the week, the more I admired their inbuilt determination to face, and overcome, whatever barrier faced them. 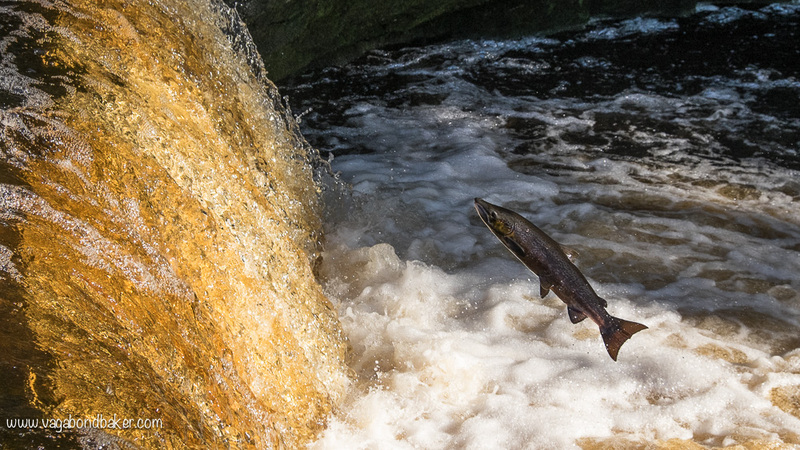 Again and again individual salmon would attempt the leap, repeatedly trying until they made it up the waterfall – only to be faced with another higher fall above them. I’ve been impressed in the past by the power and presence of creatures such as tigers and bears but in these salmon I saw a strength and power unmatched. Watching them swim against the powerful current of the river left me marvelling at their enduring determination, it was inspiring! It was fun being a wildlife photographer for the day, I certainly don’t mind sitting in a sunny spot next to a picture perfect waterfall waiting for a fish and I was pretty pleased with the images my little Fuji camera produced too! Sunday Musings: That Time I Saw The Northern Lights in Yorkshire! Yes, really, I have photos to prove it! Fantastic photos! I recently saw a piece on the telly prog The Great British Year – what a story of amazing determination! Have they finished leaping for this year now? 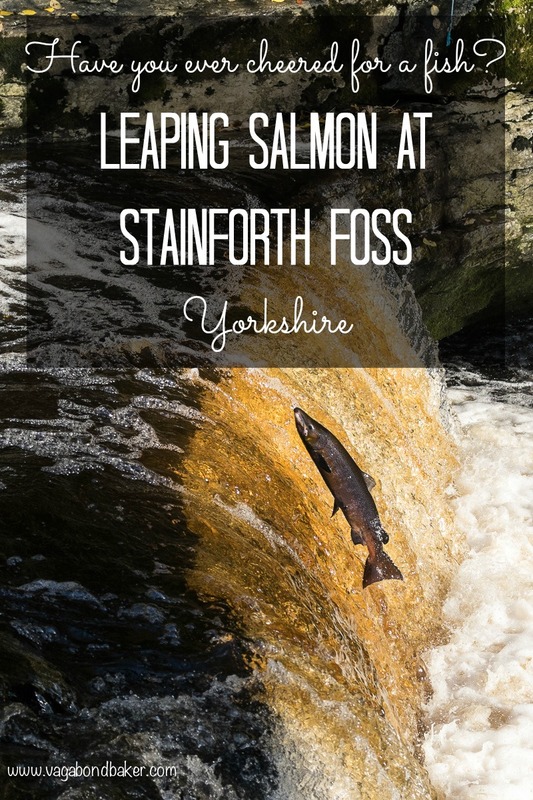 Rachel, these photographs are absolutely spectacular – you get such a sense of the leap and the anticipation from looking at them and I had no idea about the journey these fish make – sounds fascinating! Thanks Shikha! You most certainly do! I’ve known about them for a while, it is so interesting and amazing to witness! Thank you so much Dave! Yes, go find a great river and watch them! Be careful though, there’ll be bears! 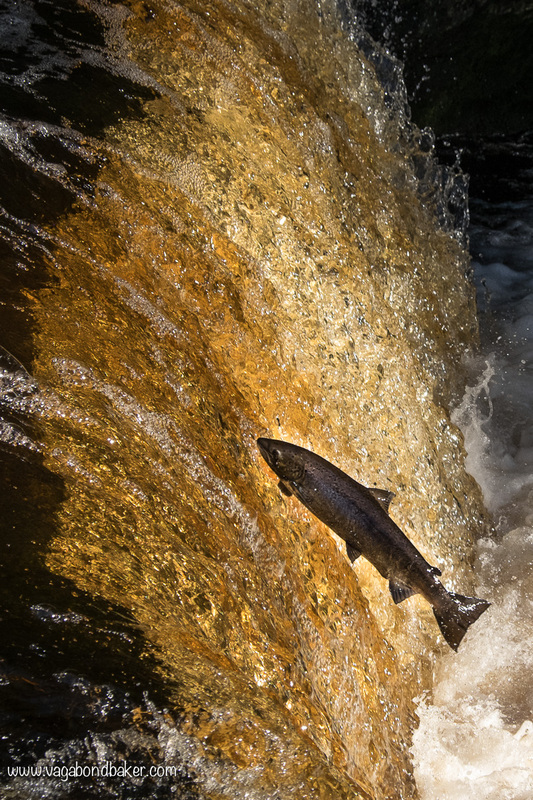 I have totally cheered for salmon before – in Washington, US. I remember being totally in awe of the little guys and then when I later saw photos of how bears will stand around and pluck the fish out of the water to eat, I was so pissed at the stupid bears for ruining it. It really is an amazing thing to witness! Bears are amazing and fun to experience but I’m happy to watch these British salmon in a bear-less environment! I never appreciated the power of the salmon until now. Glad to hear you’ve cheered them too! Thank you Katya! That’s lovely to hear! Incredible photos and such an interesting activity – cheering for the fish! I can imagine you developed an appreciation for their innate persistence. Thanks Megan! It is so fascinating, I imagine this happens in US and Canada too, I’ve seen bears waiting with open mouths to grab them in Canada. No bears here though! What a great post RAchel!